With these inspiring images beckoning her on, Lesley began her own pursuit of the exquisite orchid. After researching hundreds of varieties, she narrowed her artwork to 24, and then to six. These six are the ones she has painted for the "Orchidaceum Collection." Her "reverse glass art" technique captures the antiquity of the "Old Masters", transforming her orchid paintings into shimmering, "mother-of-pearl" like objects of desire. 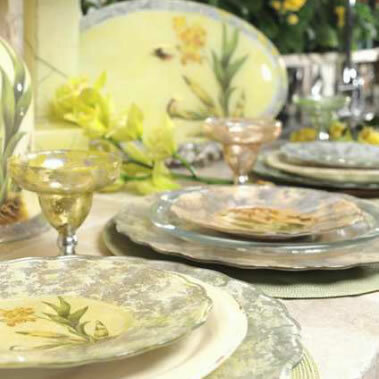 A pale peach blush, yellow champagne, or misty green color added to the crackle and base, complements the delicate hues of the orchid. Layer after layer of platinum leaf is meticulously hand-applied by Lesley's apprentices, magically illuminating each piece into a breathtaking still life. "Orchidaceum" involves yet another step, the application of additional pigment behind the platinum leafing so that the color peeks through, creating a further illusion of depth.